Biohydrogen production (BHP) can be achieved by direct or indirect biophotolysis, photo-fermentation and dark fermentation, whereof only the latter does not require the input of light energy. Our motivation to compile this review was to quantify and comprehensively report strains and process performance of dark fermentative BHP. This review summarizes the work done on pure and defined co-culture dark fermentative BHP since the year 1901. Qualitative growth characteristics and quantitative normalized results of H2 production for more than 2000 conditions are presented in a normalized and therefore comparable format to the scientific community. Statistically based evidence shows that thermophilic strains comprise high substrate conversion efficiency, but mesophilic strains achieve high volumetric productivity. Moreover, microbes of Thermoanaerobacterales (Family III) have to be preferred when aiming to achieve high substrate conversion efficiency in comparison to the families Clostridiaceae and Enterobacteriaceae. The limited number of results available on dark fermentative BHP from fed-batch cultivations indicates the yet underestimated potential of this bioprocessing application. A Design of Experiments strategy should be preferred for efficient bioprocess development and optimization of BHP aiming at improving medium, cultivation conditions and revealing inhibitory effects. This will enable comparing and optimizing strains and processes independent of initial conditions and scale. A possibility to circumvent the production of non-carbon neutral greenhouse gasses, such as carbon dioxide (CO2), is the development and continuous investigation of alternative biofuels. One promising alternative fuel is biologically generated hydrogen (H2), which is referred to as biohydrogen. Biohydrogen production (BHP) has initially been described in the 19th century [1, 2], but elucidation of dark fermentative biohydrogen production was only done since 1901 [3, 4]. Dark fermentative BHP is a carbon neutral process for production of H2 and CO2 from biomass by facultative and obligate anaerobic microorganisms. H2 offers many beneficial features, such as being harmless to mammals and the environment [5–7]. Moreover, H2 is regarded as a non-polluting fuel, because its combustion product is water (H2O). When comparing volumetric energy densities at normal conditions for H2 and methane (CH4) a drawback of H2 is emerging, since H2 comprises 3.00 kWh m-3 in comparison to 9.97 kWh m-3 for CH4. Moreover, H2 storage and transmission problems have been addressed [6, 9–12], but research for optimization is ongoing . H2 may be produced by a number of different processes including electrolysis of H2O, thermocatalytic reformation of hydrogen rich substrates and various biological processes [14–18]. To date, H2 is mainly produced by electrolysis of H2O and steam reformation of CH4. These processes are very energy intensive, but can be simply performed. Biological processes can be carried out at ambient temperatures, but they are more sophisticated in design and performance [18, 19]. BHP can be achieved by direct or indirect biophotolysis, photo-fermentation and dark fermentation [15, 16, 18, 20–25]. The main advantage of dark fermentative BHP is that the hydrogen evolution rate (HER) [mmol L-1 h-1 is higher in contrast to other BHP processes [11, 12, 17, 26]. Major known drawbacks of dark fermentative BHP are the low yield of H2 per substrate consumed (Y(H2/S)) [mol mol-1, which is due to metabolic fundamentals . Moreover, concomitant production of carbon rich metabolites (i.e. organic acids, alcohols) and CO2 is shown  and must be individually evaluated for each strain. CO2 can be removed or separated from H2, sequentially stored in biomass , or converted to other substances, such as CH4[30, 31]. Basic microbiological investigations and bioprocess engineering research was performed to increase the overall strain performance of BHP during fermentation of pure microorganisms [32–34]. For a structured approach, we classified the vast amount of information available in literature in respect to the process modes, such as closed batch, batch, chemostat culture and fed-batch conditions and quantified the main performance attributes. We reviewed the exciting work published on microbial strains capable of dark fermentative BHP with the aim to demonstrate the versatile portfolio of H2 producing genera and the wide range of possible substrates for this purpose. In the present contribution the Y(H2/S), HER and specific hydrogen productivity (qH2) [mmol g-1 h-1] of the families Clostridiaceae, Enterobacteriaceae and Thermoanaerobacterales (Family III), as well as mesophilic and thermophilic cultivation conditions have been statistically compared. We analyse the microbiological and biochemical engineering approaches for optimization of H2 production and provide a comprehensive summary of the current status of dark fermentative BHP from more than 2000 different conditions. Herewith we want to stress that more quantitative work is urgently needed to turn this natural capacity into economic processes, based on physiological scalable parameters, which allow comparison and targeted optimization. Therefore, as a significant contribution to future work we propose a set of physiological scalable parameters for normalized results. In order to show a complete picture of each strain’s H2 production potential the results of dark fermentative BHP are presented in Additional files 1, 2, 3, 4, 5. Qualitative and quantitative characteristics are summarized as follows: taxonomic classification (genus, species, strain), quantitative performance attributes of BHP (Y(H2/S) [mol mol-1] (substrate conversion efficiency), the HER [mmol L-1 h-1] (volumetric productivity) and the qH2 [mmol g-1 h-1] (biological production capacity)), and qualitative attributes (i.e. pH, temperature and substrate). Moreover, we introduce a new categorization system in order to subclassify results according to the experimental set-up. This was required since many experiments have been conducted in sealed vials. We denote this cultivation technique as “closed batch”. This is a very prominent microbiological cultivation technique, which has to be distinguished from batch cultivation in open systems ( i.e. bioreactors). Thereafter, the following categorization was used: batch, chemostat culture and fed-batch. Many authors stress for the importance to uniformly present yield and rates of BHP [11, 12, 35]. Result comparison is most suitably to be achieved by using culture dependent Y(H2/S) and qH2, as well as the non-culture dependent HER, because these units completely describe the strains H2 production characteristics. Moreover, the yield and rates are independent of scale and initial process conditions. We are certainly aware of the fact that presentation of results is even more advantageous based on a C-molar basis of the substrate . Therefore, experiments have to be performed on defined media rather than on complex media, because the calculation of C-molar yield and productivities is not possible when analysing the performance in complex media. Thus, sophisticated analysis methods need to be considered for the evaluation of Y(H2/S), HER and qH2 based on C-molar mass balance. In this respect, we want to generally stress the importance of result presentation using mass balances, which is very important for quality assurance and must not be omitted . Complete quantitative comparison of dark fermentative BHP would become possible if a C-molar basis of result presentation is used throughout the scientific community. A summarization the distribution of quantitative results obtained from different experimental set-ups of dark fermentative BHP is shown in Table 1. It becomes obvious that Y(H2/S) is most often presented, which is followed by the HER, whereas qH2 is described in less extent. Most studies on Y(H2/S) or HER were performed by either closed batch or batch fermentation (Additional files 12). A special case represents the fed-batch fermentation, whereof only five results for Y(H2/S) can be found in literature . Results of BHP from defined co-culture examinations are also presented within the Additional files 1234. Many dark fermentative BHP strains were isolated and characterized, but quantitative information on H2 production is missing. These strains and their corresponding growth requirements can serve as a pool to extend microbiological and bioprocess engineering examinations to new taxa. Furthermore, we are often confronted with the fact that quantitative results are assessed, but cannot be normalized by using the units Y(H2/S), HER or qH2, because of missing or undefined entities for recalculation of presented results. Consequently, these results and corresponding conditions are assigned to Additional file 1, because we have not been able to normalize these results for comparison purposes. Dark fermentative BHP is found to be most often performed by strain cultivation in closed vessels (Additional file 2). Closed batch technique offers the main advantage that highly sophisticated bioprocess cultivation set-up for research can be omitted. Moreover, simple incubation conditions may be easily accomplished, because only incubation in H2O or air bath is necessary. In our opinion a closed batch investigation is highly advantageous in order to examine physical factors affecting BHP. For instance the elucidation of optimum temperature values, the effect of gas pressure, the influence of illumination or the investigation of agitation can be investigated. In this respect the inhibition of CO2 and H2 was described [39, 40]. Additionally, by using closed batch technique, the substrate utilization spectrum can be investigated. This mode has the advantage to screen fast, determine optimal physical parameters, and describe their relationship to the physiological performance. Hence, the application closed batch is indeed of great value. The elucidation of chemical factors on BHP, such as the pH value seems to be rather difficult, because balanced growth at a certain pH value by means of base addition cannot be simply achieved. The investigation of the initial substrate concentration and medium amendments in order to optimize medium composition has been conducted, and the results led to an optimized medium composition [41, 42]. A disadvantage of the closed batch technique is the discontinuous monitoring of culture parameters and the occurrence of unstable culture conditions due to sample removal and/or inhibition of BHP by build up of liquid and gaseous metabolic end products, because these excreted cellular end products cannot be continuously removed from the closed culture vessel. Manipulation to the culture vessel or to the culture itself requires at least the disruption of one physical factor. This unavoidably results in non-continuous cultivation conditions, making the utilization of closed batch technique rather unattractive, if sampling occurs more than once, because the culture response to changes in environmental conditions occurs rapidly . Considering advantages and disadvantages of closed batch investigation the most urgent question to be addressed is: how quantitative is closed batch? Although, balanced growth may not be achieved, H2 production and growth kinetics were successfully investigated using closed batch technique [41, 42]. End product inhibition occurring during closed batch investigation resulting from the production of solvents, organic acids, alcohols, CO2 or H2 partial pressure build-up certainly influences the results [39, 40]. Hence, closed batch systems can be used for fast screening, but open cultivation systems need to be used for subsequent examination of the physiological potential of the strain and for quantitative bioprocess development. We provide an overview of dark fermentative BHP in bioreactors and similar set-ups, such as modified Erlenmeyer-flasks and refer to these examination techniques as open systems, because gas sparging, offgas composition determination, pH titration and medium supplementation can be performed. By using a highly controlled and automated set-up it is possible to quantitatively describe the strains inherent H2 production capacity and growth kinetics. Usually, this is performed by using fully automated and controlled bioreactor set-ups [34, 44]. We compare the strains based on their BHP potential on glucose, and do not distinguish between growth on complex or defined medium. Furthermore, the pH value and temperature was not taken into account for comparison purposes. Many quantitative investigations related to biohydrogen production were conducted by using batch type fermentations. Hereof, the genera Bacillus Caldicellulosiruptor Clostridium Enterobacter and Escherichia were most widely studied (Additional file 3). 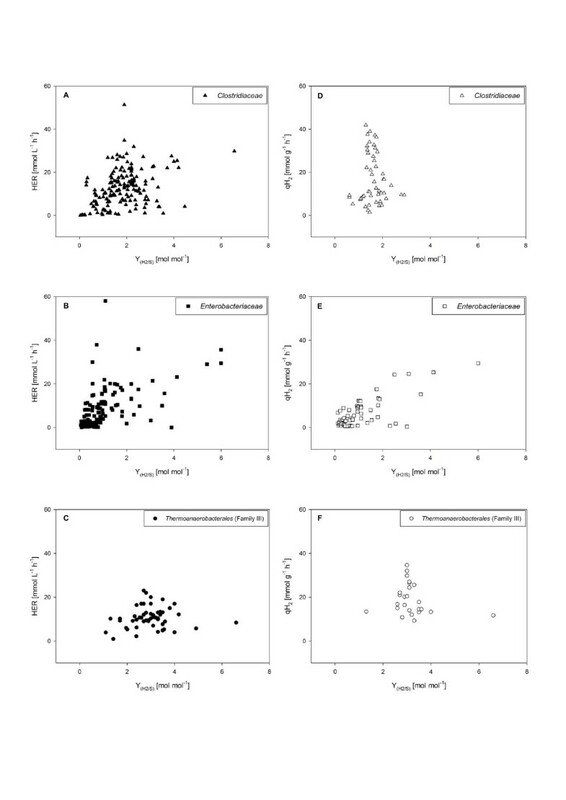 Based on Y(H2/S) we identified Caldicellulosiruptor owensensis DSM 13100  and Enterobacter cloacae DM 11  showing highest Y(H2/S) of 4.0 and 3.9 mol mol-1, respectively. The highest HER of 32 mmol L-1 h-1 is shown for Enterobacter cloacae II BT-08 , which is followed by Clostridium sp. strain no. 2 showing a HER of 27 mmol L-1 h-1. When analysing results for the highest qH2 we reveal that Caldicellulosiruptor saccharolyticus DSM 8903 produces 23 mmol g-1 h-1. Dark fermentative BHP has often been investigated in chemostat culture. The results are summarized in Additional file 4. Thereof Caldicellulosiruptor saccharolyticus DSM 8903 is identified to comprise the highest Y(H2/S) of 4.0 mol mol-1. Highest HER of 77 mmol L-1 h-1 is reported for Enterobacter cloacae II BT-08 . The highest qH2 of 35 mmol g-1 h-1 is identified for Caldicellulosiruptor kristjanssonii DSM 12137 . The literature survey of dark fermentative BHP revealed only five conditions which have been operated in fed-batch mode (Additional file 5). The quantitative presentation of these results is restricted to the Y(H2/S). The maximum Y(H2/S) is identified for a recombinant strain of ATCC 25755 comprising 2.15 mol mol-1. The limited number of results available for dark fermentative BHP from fed-batch fermentation is due to the fact that usually the application of this technique leads to massive accumulation of organic acids and other reduced end products (i.e. alcohols) in the culture broth, strongly inhibiting the growth and H2 production kinetics. Consequently, fed-batch investigation can be applied only by using broth exchange or cell separation systems . Based on such experimental set-ups high cell densities and feed flow rates above the maximum specific growth rate can be reached . The potential of fed-batch cultivation for H2 production is yet underestimated in terms of quantity and quality (Additional file 5). Thus, the quantitative potential of fed-batch cultivation has to be exploited in more detail for dark fermentative BHP by using biochemical engineering principles. As summarized in Additional files 2345 quantitative examination of dark fermentative BHP is largely performed on strains phylogenetically related to either the family Clostridiaceae or Enterobacteriaceae, but also strains belonging to the family Thermoanaerobacterales (Family III) receive increasing scientific attention, because they comprise certain beneficial metabolic features [46, 48–51]. According to Table 2 less results for qH2 than for HER compared to the Y(H2/S) are described. This discrepancy in the number of results available in literature is interesting, because during research the determination of biomass concentration and H2 offgas content could be easily performed. We analysed Clostridiaceae Enterobacteriaceae and Thermoanaerobacterales (Family III) in order to elucidate differences of the performance of these families concerning HER and qH2 in respect to Y(H2/S). The basis for comparison is either any carbon substrate (Figure 1) or glucose (Figure 2), but irrespectively of growth conditions and metabolic modifications. A graphical overview is shown irrespective of the utilization of the carbon substrate, medium composition and cultivation conditions of the HER of Clostridiaceae (A), Enterobacteriaceae (B) and Thermoanaerobacterales (Family III) (C) plotted against the Y (H2/S) . The qH 2 of Clostridiaceae (D), Enterobacteriaceae (E) and Thermoanaerobacterales (Family III) (F) is shown in relation to the Y (H2/S) . It is indicated that Clostridiaceae and Enterobacteriaceae perform better than Thermoanaerobacterales (Family III) in respect to the volumetric productivity. The qH2 for Clostridiaceae and Thermoanaerobacterales (Family III) is shown to be higher than for Enterobacteriaceae. Regarding the substrate conversion efficiency (Y(H2/S)) the following ranking is indicated: Thermoanaerobacterales (Family III) > Clostridiaceae > Enterobacteriaceae. A graphical overview of the utilization of glucose is presented. HER of Clostridiaceae (A), Enterobacteriaceae (B) and Thermoanaerobacterales (Family III) (C) is shown in relation to the Y (H2/S) . The qH 2 of Clostridiaceae (D), Enterobacteriaceae (E) and Thermoanaerobacterales (Family III) (F) in relation to the Y (H2/S) is also presented. These results are depicted irrespective of the medium composition, cultivation conditions or genetic modification. 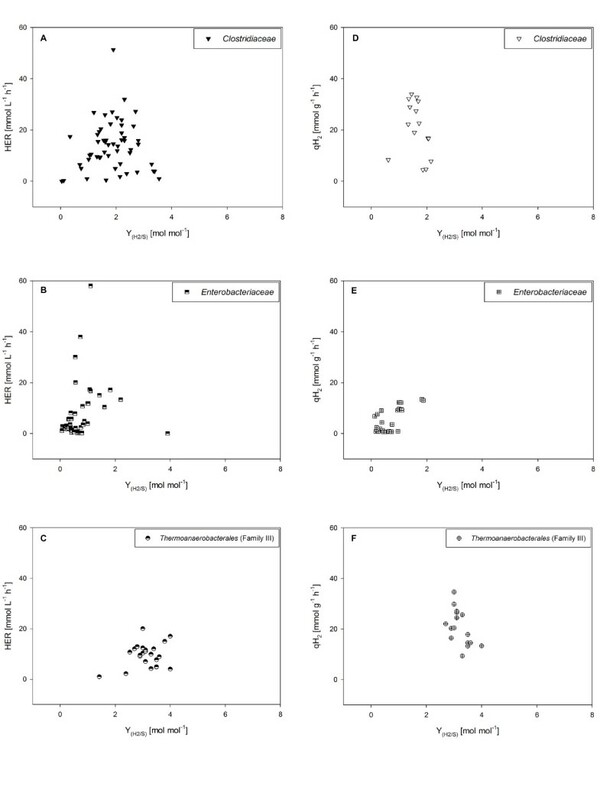 These graphs offer an indication that Clostridiaceae and Enterobacteriaceae show a higher volumetric productivity than Thermoanaerobacterales (Family III). In respect to the qH2Clostridiaceae and Thermoanaerobacterales (Family III) show higher productivity than Enterobacteriaceae. Based on the Y(H2/S) following ranking is presented: Thermoanaerobacterales (Family III) > Clostridiaceae > Enterobacteriaceae. These three culture parameters are plotted against each other on any carbon substrate (Figures 1A-1F). Based on the HER Clostridiaceae and Enterobacteriaceae comprise highest volumetric productivity, whereas in respect to the specific H2 productivity Clostridiaceae and Thermoanaerobacterales (Family III) are indicated to perform better. Nonetheless, a clear trend towards better substrate conversion efficiency is revealed: Thermoanaerobacterales (Family III) > Clostridiaceae > Enterobacteriaceae. Secondly, the HER, qH2 and Y(H2/S) are graphically analysed for the growth of the three families on glucose, but independent of the utilization of complex or defined medium, cultivation conditions or metabolic modifications (Figures 2A-2F). In principle analogous trends for the HER, qH2 and Y(H2/S) of the three families can be shown for the growth on glucose compared to the growth on any carbon substrate. Above paragraph described the interrelations between the physiological parameters of Clostridiaceae Enterobacteriaceae and Thermoanaerobacterales (Family III). Subsequently, we want to statistically evaluate their dark fermentative BHP potential. Firstly, a comparison has been done based on the median in order to identify a superior performance of one of the three families regarding the Y(H2/S), HER and qH2. Secondly, the mean between these families has been individually analysed by using the Welch-test, or where applicable by using the Student’s t-test, at a level of significance of p = 0.01 . Normalized results available in the Additional files 2345 have been used for comparison purposes. The results are summarized in Table 2. By comparing the median in respect to the Y(H2/S), HER and qH2 we can show that strains perform as follows: Thermoanaerobacterales (Family III) > Clostridiaceae > Enterobacteriaceae. Statistical analysis of the mean only allows a most significant statement for the Y(H2/S), but not for the HER and qH2. Herewith we present evidence that strains of Thermoanaerobacterales (Family III) perform most significantly better in respect to the Y(H2/S) of Clostridiaceae and Enterobacteriaceae. Also strains from the family Clostridiaceae are found to comprise a most significantly higher Y(H2/S) than strains of the family Enterobacteriaceae. Based on our statistical investigation we reveal that strains of the family Thermoanaerobacterales (Family III) have to be clearly preferred when aiming to achieve a high Y(H2/S) in comparison to the families Clostridiaceae and Enterobacteriaceae. In order to compare the dark fermentative BHP performance of mesophilic (20-44 °C) and thermophilic (45-80 °C) strains we used the results shown in Additional files 2, 3, 4, 5. As mentioned above statistical analysis has been carried out to evaluate the difference in terms of Y(H2/S), qH2 and HER. The results are summarized in Table 3. We can clearly show that thermophilic strains are superior to mesophilic strains in respect to the Y(H2/S). This result is also supported in the values for the median, which also shows the higher Y(H2/S) of thermophilic strains. Herewith most significant evidence is presented to favour mesophilic over thermophilic strains in respect to the HER, which is also reflected in the value determined for the median. Unfortunately our statistical analysis of qH2 cannot present a beneficial result of one or the other group, but nevertheless the mean and the median show a trend to favour thermophilic over mesophilic strains. Thus, we are able to present statistical evidence demonstrating to use thermophilic strains when aiming on a high Y(H2/S), but to use mesophilic strains to achieve a high HER. The initial microbiological investigation of strains for biological H2 production offers the opportunity to characterize the microbes in full detail, for instance in respect to pH, temperature and substrate utilization spectrum. Moreover, phylogenetical information will eventually be retrieved during strain characterization. We suggest using the information on strains and conditions available in Additional files 12345 to extend studies of dark fermentative BHP to broader substrate diversity. These strains offer promising experimental endeavours to microbiologists for physiological studies, because many of these strains are yet not characterized in detail [53–56]. Many wild-type strains were found to comprise a high Y(H2/S) and high qH2[44, 51, 57]. Moreover, basic research efforts need to be increased to isolate novel dark fermentative BHP strains from the environment, because up to date only few of the estimated existing microbes have yet become cultivable [58, 59]. Still the optimization of dark fermentative BHP by using wild-type microbes is an alternative. Another highly noteworthy field related to dark fermentative BHP is the strain identification based on in silico analysis. The information gain is not restricted to phylogenetical knowledge, but also sequence information on enzymes is available [60, 61]. Therefore, substantial information on the catalytic units for H2 production can be retrieved. Moreover, screening for specific enzymes in respect to substrate breakdown and utilization can also be done. Isolated information on certain microorganisms can be retrieved, but also whole genomes of several dark fermentative BHP strains are sequenced and provide full access for physiological and in silico analysis, offering putative modification possibilities towards metabolic engineering objectives. Metabolic engineering is especially important for dark fermentative BHP strains that comprise high Y(H2/S) and qH2, but whereof high volumetric production rates are either inherently limited by metabolic bottlenecks (i.e. organic acids, solvent and alcohol production) or, when concerning thermophilic strains, by their achievable cell densities. Usually Escherichia coli is the target for metabolic engineering [62–68]. Since Clostridia spp. show high Y(H2/S) and high qH2 in comparison to Escherichia spp., metabolic strain engineering is an interesting option in order to increase HER. Nevertheless, Escherichia spp. can be genetically modified relatively easy in respect to their facultative anaerobic growth characteristic [64, 65, 67, 69], hence, allowing unsophisticated achievable growth in a variety of culture vessels. Clostridia spp., Caldicellulosiruptor spp. and other strict anaerobic genera in turn require more sophisticated cultivation set-up, because they are obligate anaerobes. Nevertheless, strains of both genera have been genetically modified [64, 65, 67, 69–72]. In this respect the application of directed evolution  towards optimization of cultivation conditions or the substrate utilization spectrum could be another favourable approach. For a robust and commercial usefully application of dark fermentative BHP several factors have to be addressed. Firstly, chemical (i.e. pH, ionic strength, CO2 solubility) and physical factors (i.e. temperature, partial pressure of H2 and CO2, agitation) influencing the Y(H2/S) and qH2 need to be identified, which are usually already known and differ between various strains [28, 40, 74–77]. By using open cultivation systems removal of inhibitory gaseous compounds could be and is done by continuous stripping with inert gas. Secondly, factors for increasing the HER (cell retention, end product inhibition) have to be elucidated. In order to enhance the HER, an increase of the biomass concentration is required. This may be accomplished by using membrane filtration to separate unwanted metabolites and retain the biomass within the bioreactor. Hence, fed-batch cultivation for dark fermentative BHP can become a promissing approach. The medium contains the carbon substrate for biomass and H2 production and is a very important starting point for optimization during bioprocess development. Many conditions, which are presented in Additional files 1, 2, 3, 4, 5, do not properly reflect the status of a pure carbon source for H2 production. Hence, in many experiments complex medium amendments are used. Since most of the undefined compounds undergo temporal fluctuations from lot to lot during the production process, its composition is not always consistent. Hence, the use of complex compounds does not easily allow conclusions on the influence of the carbon source on H2 production. In order to establish a robust bioprocess quantitative work on defined medium needs to be performed for strain characterization. This is an important consideration in order to elucidate the strains growth parameters and inherent potential of H2 production. Many articles have analysed the impact of the medium composition in order to increase Y(H2/S), HER or qH2[35, 78–82]. These investigations have been performed invariantly, thus by changing only one culture variable, but more and more examinations use the advantage of Design of Experiments (DoE), which has proven to be very successful [41, 55, 83–89]. This experimental strategy allows multivariate analysis by modification of several variables at one time, and moreover to optimize for the response(s) of interest. During the successive steps of a DoE application, optimization of BHP can be achieved by elucidation of medium components, but also on other products than H2, such as CO2, organic acids, solvents and alcohols or even other inhibitory compounds. Moreover, the influence of chemical and physical parameters on H2 production may be included in the investigation. Hence, a comprehensive DoE is much faster in identification of the optimal operation point, to be individually optimized for the bioprocess of interest. DoE screening and successive optimization results in an amended medium composition, identifies the corresponding culture parameters and concomitantly the optimum cultivation conditions for improved H2 production. Our review shows the inherent potential and the need for quantitative investigation of pure culture dark fermentative BHP. Especially the elucidation of non-food substrates for H2 production is possibly of higher potential commercial applicability. From this point of view, the use of complex media for H2 production could rather represent a putative real case scenario. However, strain characterization is crucial and has to be performed in defined media for elucidation of the strain's full physiological potential. Herewith we propose a set of physiological scalable parameters for characterization and optimization of dark fermentative BHP strains by using bioprocessing. The first step should be a sound investigation by appication of DoE for elucidation of the following culture parameters: Y(H2/S), MER and qH2. In a successive investigation the addition of complex or undefined medium componets should to be investigated and compared in respect to initial elucidated culture parameters. Hence, future investigations in this field of bioprocessing could be rapidly completed. This review summarizes the work done on pure and defined co-culture dark fermentative BHP since the year 1901. Qualitative growth characteristics and quantitative normalized results of H2 production for more than 2000 conditions are presented. Now these normalized and comparable results become available to the scientific community. Statistically based evidence shows that thermophilic strains comprise high substrate conversion efficiency, but mesophilic strains achieve high volumetric productivity. Microbes of Thermoanaerobacterales (Family III) have to be preferred when aiming to achieve a high Y(H2/S) in comparison to the families Clostridiaceae and Enterobacteriaceae, based on a comprehensive statistical substantiation. The limited number of results available on dark fermentative BHP from fed-batch cultivations indicates the yet underestimated potential of this bioprocessing application. For an efficient bioprocess development the optimization of H2 production by using DoE strategy for medium modification, cultivation condition improvement and inhibitory compound analysis should be preferred and a set of physiological scalable parameters is suggested. Comparability of key culture parameters of dark fermentative BHP is of utmost importance and thus the following entities should be used for the presentation of results: Y(H2/S) [mol C-mol-1], HER [mmol L-1 h-1] and qH2 [mmol g-1 h-1]. Moles of hydrogen produced per moles of substrate consumed. The authors greatly acknowledge Prof. Dr. Helga Stan-Lotter and Prof. Dr. Peter Holubar for helpful discussions. We want to thank Dr. Christian Dietzsch, DI Arne Seifert and Dr. Oliver Spadiut for critical comments on the manuscript. SR reviewed the literature on dark fermentative biohydrogen production, prepared the tables, figures, additional files, performed the statistical analysis, drafted the manuscript and coordinated the review. SR and CH contributed to the conception and design of the manuscript. CH helped to draft the manuscript. All authors have read and approve the final version of the manuscript.